Join the discussion on our forums! Come discuss Dreampetal Florist over in our dedicated Dreampetal Florist discussion topic. I love this card. Played it against a priest who couldnt deal with it for 3 turns. Got maly alex and lich king out super cheap. The card is okay, but this conversation needs a healthy dose of reality. You play a 4/4 do-nothing on turn 7 against an aggro deck. They kill you on their next turn. Or heck, they kill you even before you get to turn 7. I wouldn't worry about this one. Turn 7? Did you mean turn 4? i think with this expanision we can have a decent malygos druid in standard without twig of the world tree. you can on 10 mana play Drakkari Enchanter, and Dreampetal Florist. and in your hand you have Malygos, Gloop Sprayer, and Flobbidinous Floop. then in worst case scenario floop gets the cost redution and you get 11 mana saved and not 14, but then it all still fits, play Malygos for 9, Flobbidinous Floop for 0 as a Malygos, and then Gloop Sprayer for 1 in between them, and then you have spell damage +20 for your 2 Moonfires. i know this is a 2 turn set up, and that will decrease the powerlevel by a lot, but they still cant to anything about it making this deck not all to shabby. especially when you have Juicy Psychmelon to draw most of those cards. 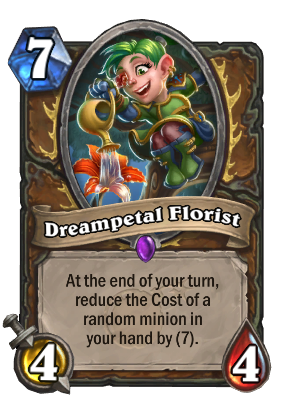 couldn't the Dreampetal Florist trigger twice on the same minion? causing you to either hope your florist makes it another turn and doesn't reduce the same minion again, or spread your Malygos plays out over a few turns, which makes them very susceptible to removal. I have no idea if that's how the effect works, but considering the text, "reduce the cost of a random minion in your hand by ", there is nothing that states it can't trigger twice on the same minion, or that it won't trigger on minions already at zero cost. additionally, because this combo relies on 5 different minions to work as effectively as it can, it's very susceptible to Demonic Project , which seems to be seeing a lot of play in counter-combo Warlock decks. not impossible to pull off, but there does seem to be a bit of luck involved. and about demonic project, i had posted that before the expansion came out, i dont know if demonic project was revealed yet, and if it was i had not had it in mind. Gloop Sprayer and Flobbidinous Floop (with Coin or Innervate)says hello. oi oi. this on malygos. maly for 2, 2x swipe +2x moonfire is 30 damage. OP much? While the stats are not ideal for 7 mana, it literally does pay for itself with a single mana reduction on a minion. If you somehow get a second use out of it.... you pretty much won the game. I see this particularly being strongest with Malygos Druid which could allow you to throw Swipe or other spells that can hit face into the mix rather than just Moonfire. Some potential with Big Druid as well although I doubt that deck really needs help to do what it does. very good in big and mally druid. Lets you play 9/10 drops on turn 8 for cheap. It is slow so you do need to stabilize first, but I think the pay off is worth it and they have to either kill it or kill you.